CT 248 is a small shelf speaker with Seas drivers. For high frequencies the Seas 22 TAF/G tweeter with aluminium / magnesium diaphragm is used, for bass the Seas ER 15 RLY. The crossover is a modified 12 dB/oct. containing a wave trap in the signal path to the woofer, to eliminate resonance between 7 and 8.5 kHz. 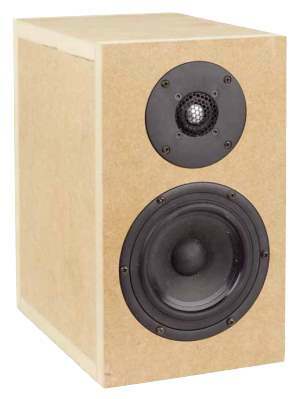 ... "The sound of the CT 248 exceptionally well balanced and refined. With appropriate look and feel nobody would suspect that not even 100 Euro of driver material per channel have been employed. The bass pleases with a punchy yet distinctively clean note touch. Going on from here is a clean midrange free of colouration and misbehaviour of any kind. Not only are the lab results pleasing, the acoustical properties of the tweeter, too. The metal dome is typically balanced, almost mellow, yet still detailed and accurate. The same can be said, due to the drivers being in phase, about the excellent, realistic three-dimensionality, refraining from any gimmickry. This Cheap Trick is indeed more than just the sum of all parts. The CT 248 could easily stand the test with ready-made contenders costing many time more. Great, the same is true for all Cheap Tricks. Rarely however, did a speaker of this category sound so airy and delicate, so well balanced and unerring in attention to details." Our high-end version comprises two low-distortion, 1.4 mm baked varnish coils in the signal path to the woofer. In the signal path to the tweeter we employ one Jantzen Z-Superior MKP capacitor.